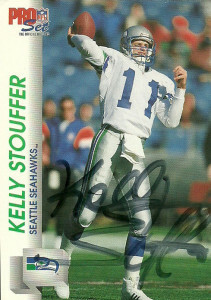 Kelly Stouffer had some fine cards for having such a short career in the NFL. He always titillated us as the future of the Seahawks at quarterback, but Seattle always fell in love with another quarterback before his time actually came. The greatest quarterback in Colorado State history, the St. Louis Cardinals fell in love with the statistically heavy quarterback and drafted him with the 6th overall pick of the 1987 draft. The team envisioned him as the heir apparent to Neil Lomax. The plan made perfect sense except for one thing: The Cardinals could not come to terms with Stouffer the entire year. It was a big blow to St. Louis, so the team opted to trade him to the Seattle Seahawks. 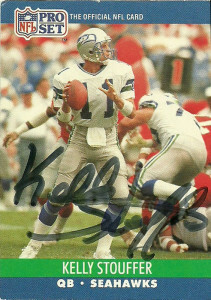 Seattle had long been the domain of another savvy aged quarterback, Dave Krieg- and he would not go down without a fight. Kreig though was injured, and with his backup ineffective, Stouffer was given a chance to step in. He’d post a 3-3 record in relief of Dave, including a game in which Stouffer completed 26 of 47 passes for a then NFL Rookie Record 370 yards and a touchdown in a loss to the New Orleans Saints. He’d return to the bench with the return of Kreig. Dave took pole position for the whole 1990 season. 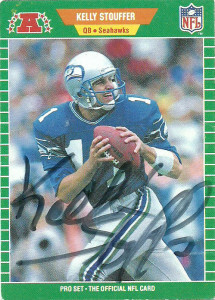 The Seahawks in the meantime became enamored with quarterbacks, drafting Dan McGwire in the first round of the 1991 draft to be the new future of the franchise. As Krieg became more brittle behind the Seahawks porous offensive line, no less than 4 QBs started that season for the team, including Stouffer for a game. With Kreig signing as a free agent with the Chiefs in 1992, the quarterback competition was wide open. Stouffer actually won the job in camp, and flashed some signs of former brilliance in 7 starts, but eventually found himself on the bench both yielding to McGwire and Stan Gelbaugh. After the season the team released Stouffer, as they planned to draft Rick Mirer. Stouffer briefly popped up again on the radar as a backup for the Dolphins and Carolina Panthers, before he retired in 1996. Stouffer went into broadcasting, honing his skills as a commentator in the NFLE. He then moved back to stateside broadcasts, working college broadcasts for the Mountain West Conference. As of 2016 he’s a member of the ESPNU crew as a college football analyst.